There is something about the French and their relationship with food that I absolutely adore. The people from the land of bread and cheese somehow are also known for their thin physique and longevity, so they must be doing something right! Of course, French food is far more than bread and cheese. Not to pull a Julia Child here, but the food is so diverse, offers so much to a palette, and can be uniquely dependent on the region. The French are known to snack throughout the day, and also are firm believers in a mid-day meal. In the Provence region of France, chickpea is a popular component of dishes. I love chickpeas so I’m always excited when I come across another way to incorporate them into a meal. 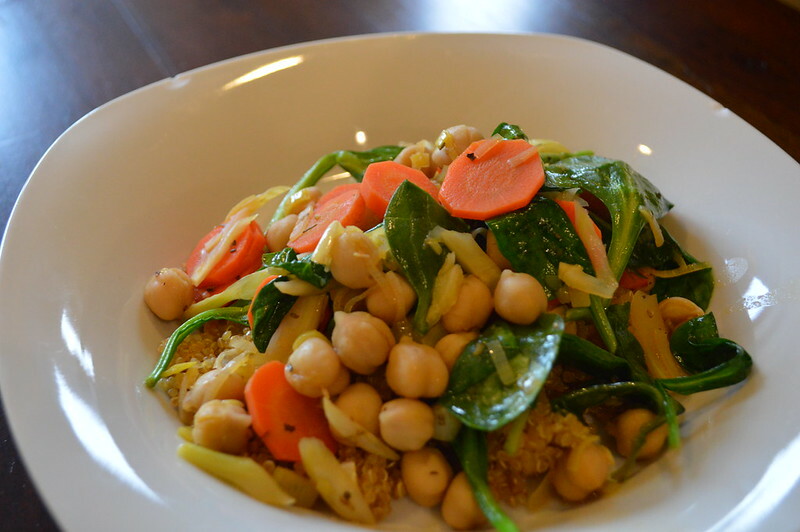 Recently, I set out to find a new chickpea recipe of the light and healthy variety and I came across a chickpea bajane. 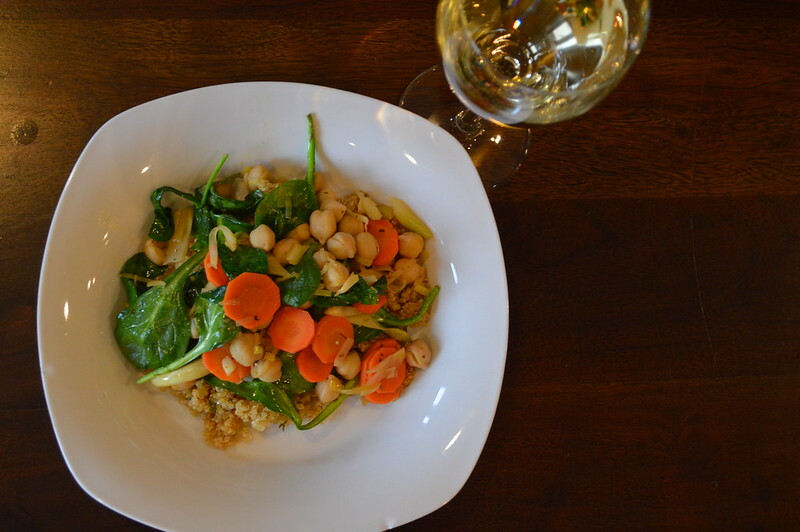 Bajane is a Provençal term for “mid-day meal,” and this dish incorporates two of my favorite meal components: chickpeas and quinoa, plus a host of healthy vegetables. I knew I had to give it a try. I have a love-hate relationship with fennel, a component of the recipe. I decided to go all in and not make any adjustments, and in the end I was so happy I did. This dish is light, but packed with flavor; the chickpeas and quinoa are sure to help you fill up without the guilt. Fresh thyme and fennel seeds add a great flavor and make a palate-pleasing dish, plus they also leave your kitchen filled with a delicious aroma. So grab a glass of a Provençal rosé—we suggest Whispering Angel—and enjoy this dish any time of the day. To prepare quinoa, heat 2 teaspoons oil in a large saucepan over medium-high heat. Add 1 garlic clove to pan; sauté 1 minute. Add 1 cup broth and next 4 ingredients (through 1/4 teaspoon salt); cover, reduce heat, and simmer 15 minutes or until liquid is absorbed and quinoa is tender. To prepare chickpea mixture, heat 1 t oil in a Dutch oven over medium-high heat. Add leek and 4 garlic cloves to pan; sauté 5 minutes or until tender. Add remaining 1 teaspoon oil, fennel bulb, carrot, and fennel seeds; sauté 10 minutes or until vegetables are golden. Add wine; cook 3 minutes or until liquid almost evaporates. Stir in 1 cup broth, 2 teaspoons thyme, and chickpeas; cook 1 minute or until thoroughly heated. Remove from heat; stir in juice, 1/4 teaspoon salt, pepper, and spinach. Place about 2/3 cup quinoa in each of 4 bowls; top each serving with about 1 1/2 cups chickpea mixture. Sprinkle each serving with 1/2 teaspoon thyme.